The female Asian Tiger needs blood to develop her eggs. The spring weather will drive many outdoors, happy to soak up the sun after the cold winter days. But for others, the warm spring air brings with it the impending awakening of the Asian Tiger mosquito with all the misery it inflicts. Although it is not yet certain why some are so badly affected by its bite while others feel only fleeting irritation, those who react badly to it know only too well the sleepless nights accompanied by unbearable itching. Some will even suffer a severe reaction requiring medical attention. The Asian Tiger mosquito varies between two and 10 millimetres in length, has a black and white striped body and legs similar to a tiger’s, hence its name. Although this mosquito was originally native to the tropical and subtropical areas of southeast Asia, it was inadvertently exported to other parts of the world where it settled and rapidly adapted to different climates, surviving even freezing temperatures, which makes it very difficult to eradicate or control. The online Global Invasive Species Database lists the Asian Tiger mosquito (Aedes albopictus) as one of the 100 most invasive species in the world. In Malta, the Asian Tiger was first officially recorded in 2010 and it has since become a fixture of our warm weather months. In temperate zones such as Malta, the mosquito hibernates during the colder months, but its eggs survive the winter ready to hatch as soon as the weather warms up. The female Asian Tiger likes to lay her eggs near still or stagnant water. So anything that holds water long enough for the eggs to develop will help the mosquito to proliferate, even it contains only a few teaspoons of water. As long as it finds suitable breeding grounds and food, the Asian Tiger can flourish even in areas not normally prone to mosquito infestations. The male Asian Tiger feeds on plant nectar and does not bite. The female also feeds on plant nectar, but needs blood to develop her eggs. Female Asian Tigers search for food from dawn till dusk, attacking humans, dogs, cats, birds, other domesticated animals and wild mammals. Females track down blood sources by following the scent of carbon dioxide and body chemicals. They will then persistently scout the area until they recognise a good host. Having located a possible target, the female Asian Tiger will approach its intended victim at ankle level and advance up the body until it obtains access to blood. 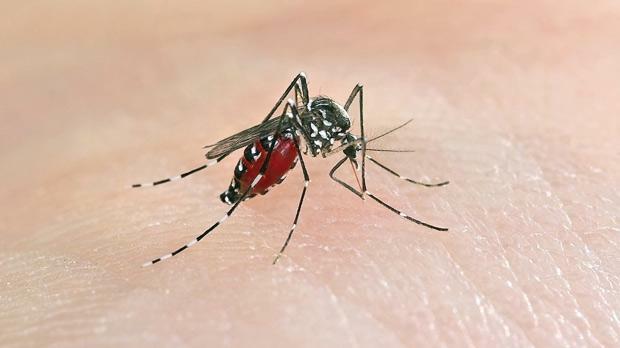 Because these mosquitos are inherently cautious, they will interrupt their feeding several times if they sense any danger to themselves, and then attack time and again until they are fully engorged. This means they will either bite the same victim several times in different places, or else bite different victims during each feed. Their easy substitution of one victim for another has contributed towards their success in transmitting disease. Children, young adults and the elderly are particularly at risk, and some of these diseases are life-threatening. In other parts of the world, the Asian Tiger has been known to transmit dengue fever, encephalitis, yellow fever, West Nile virus, and Chikungunya fever. In 2007, the Asian Tiger mosquito was responsible for hundreds of people in the Italian province of Ravenna developing Chikungunya fever. The Asian Tiger can also be fatal to cats and dogs as it can transmit a parasite that causes heartworm. Research has found that the Asian Tiger is capable of transmitting eastern equine encephalitis, a strain of encephalitis normally found in wild birds that can be transmitted to horses. Both heartworm and eastern equine encephalitis can cross over from animals to humans, so the Asian Tiger is directly re-sponsible for the transmission of diseases between species. If you have an infestation of Asian Tiger mosquitos, you need to act fast. Unfortunately, many of the techniques used to keep away the common mosquito are totally ineffective. Ultraviolet light traps fail to attract the Asian Tiger. Sound devices and mobile apps that mimic the sound of the male mosquito do not drive away the female. Mosquito traps are only partially successful. Insecticidal sprays are effective only until the spray dissipates. If you have a problem with Asian Tiger mosquitos, your best option is to seek the advice of a professional pest control consultant who will assess your environment and recommend possible solutions. A professional consultant can supply insecticides that will safely treat your gardens and shrub areas. In the meantime, you can take preventive action when you are outdoors, and destroy the places where it can breed. Mario Borg is a pest management consultant. • Whenever you need to go out between dawn and dusk, apply insect repellent that contains N,N-Diethyl-meta-toluamide (DEET). The more DEET it contains, the more effective the repellent. Apply to clothes and exposed skin according to the instructions provided with the insect repellent. • The Asian Tiger is attracted to dark clothing – opt for light-coloured clothing with a tight weave. • If the weather is not too warm, wear socks, closed shoes, long sleeves and full-length trousers. When it gets too warm – use insect repellents as back-up. • At home, install insect screens on doors and windows and regularly check them for tears or splitting. • Remove anything around your house that will hold standing water such as pets’ water bowls, bird baths, and plant trays. If any of your house plants can hold water, tip it out after watering. • Seal tight all water cisterns and cover wells properly. • If you have a fresh-water pool, consider chlorinating it. Empty out kids’ paddling pools after use. • Keep gutters clean of leaves and debris which can hold stagnant water, and drain puddles. • Work with your neighbours to reduce risks: file a report with authorities about abandoned junk and roadside litter that can hold water.